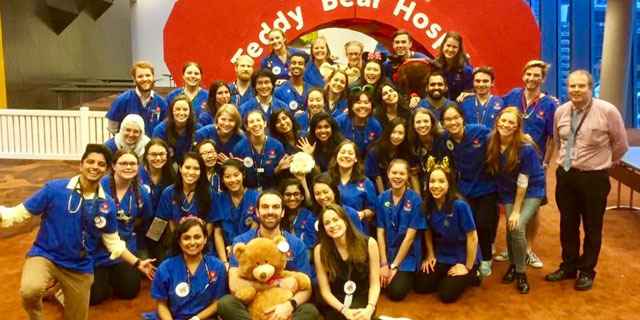 More than 1200 medicine, nursing, dentistry, physiotherapy, audiology, optometry, biomedical, science, speech pathology and social work students raised $26,429 by running a Teddy Bear Hospital for the Royal Children’s Hospital (RCH) Good Friday Appeal. The popular event saw more than 3400 Victorian children and their families in attendance, accompanied by teddy bears and other soft toys in need of medical consultations with the students. The event aims to familiarise children with healthcare settings in a fun, relaxed and interactive manner. For students, it assists them with further developing the specific communication and engagement skills required to successfully interact with children needing treatment. While the equipment, including teddy CT scanners, hydrotherapy pools, dental chairs and teddy ambulances were all hand made by students, this year’s event was much more colourful thanks to the wonderful support by VISY who provided teddy-themed backdrops, furniture and signage that delighted the children. Established by students six years ago, the Teddy Bear Hospital has raised a total of $125,000 for the Good Friday Appeal, which goes towards equipment, research and education to support the work of the RCH. The Teddy Bear Hospital is the largest student engagement event run by the University and is widely considered an exemplar of community engagement throughout the Faculty of Medicine, Dentistry and Health Sciences.